The Eagles sit atop Hockey East with an 8-1-0 record and an 8-5-2 mark overall. Their offensive leaders are sophomore Julius Mattila and freshman Logan Hutsko with 11 points each and freshman Chris Grando with 10. Sophomore Joseph Woll has handled most of the goaltending load and sports a 2.56 GAA and a .905 save percentage. Sophomore Patrick Harper leads BU with 15 points (6G, 9A), followed by Bobo Carpenter with 14 points (8 goals, 6 assists). Carpenter’s seven goals in Hockey East games are tops in the conference. 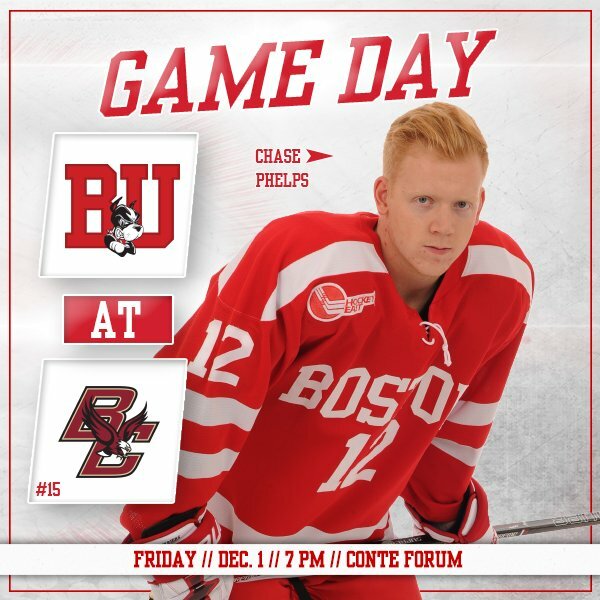 Chad Krys (13), Dante Fabbro (10), Jordan Greenway (10) and Brady Tkachuk (10) are the other Terriers in double figures. Tkachuk with a +9 is tied for the plus/minus lead among NCAA freshmen. 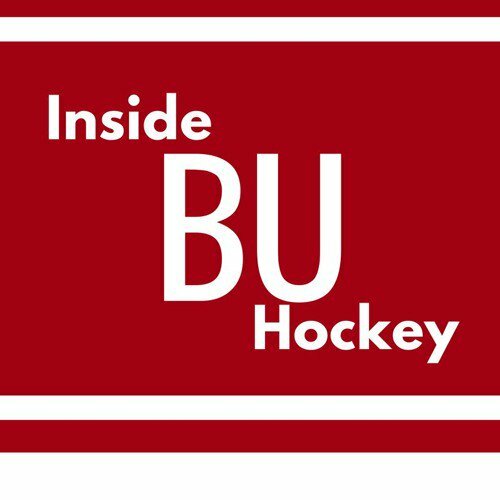 This week’s episode of Inside BU Hockey features Bernie Corbett’s interviews with Head Coach David Quinn, sophomore defenseman Dante Fabbro and Art Moher who was the radio voice of Terrier hockey during the 1978 championship season. He’ll join Saturday’s 40th reunion of the 1977-78 squad. 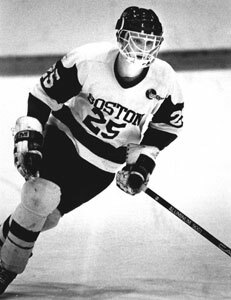 ICYMI: Last night's blogpost previews Saturday's night 40th anniversary reunion at Agganis Arena of the 1978 National Champion Terriers, who defeated BC in the title game, 5-3. We also cover the publication of Tim Rappleye's chronicle of that championship season, Jack Parker's Wiseguys, with an interview with the author, an excerpt from the book and a book review by blog contributor John Giles. Coach Parker and 1977-78 team members will be available after the game to sign copies of the book, which will be on sale at Agganis Arena. Five dollars of each purchase will be donated to the Travis Roy Foundation. 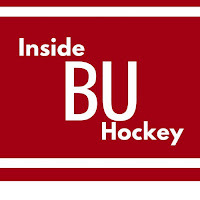 ►This week’s Hockey on Campus podcast features: UMass Coach Greg Carvel, USA Hockey Executive Director Pat Kelleher, and former Terrier forward, assistant coach and NHL standout Scott Young, who will be inducted into the US Hockey Hall of Fame in Boston on Dec. 13 . It airs on NHL Radio (SiriusXMChannel 91) on Saturday morning at 8 a.m. ET and Sunday morning at 10 a.m. ET. You can also find it here on College Hockey News. Terriers begin a home-and-home series with #2 BC today at Conte Forum. Puck drop is at 2 p.m. In the team’s first meeting of the season, the Eagles took a 4-3 decision, despite being outshot 46-18. Today’s game is the 50th all-time meeting between the teams with BC holding a 26-17-6 edge. 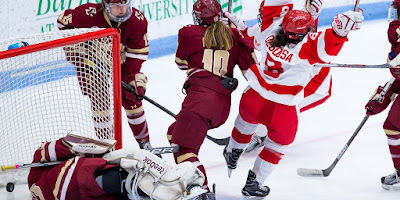 BC’s Daryl Watts (40 points) and Caitrin Lonergan (38) are the top two scorers in Division 1, followed by BU seniors Victoria Bach (31) and Rebecca Leslie (27).